I’m doing a blog swap with Kristin over at Payment Free Life today. What that means is that I’m knocking the quality of her blog down a few notches while she classes things up over here for a day. Don’t worry, I’ll be back to destroying the fabric of America soon enough. In the meantime, you can find me speaking about Money and Marriage over at her blog today. But it might surprise you to learn that I actually have been cheating on you since June 2013. That’s right. I’ve been writing about marriage over at my other blog, Confessions of a Terrible Husband for a year. Curious yet? Check me out over at Payment Free Life today. I hate paper. As a tax preparer and small business owner, I deal with lots of paper. I have receipts for my business, donation recipes, contracts, benefit paperwork, IRA and bank statements and other miscellaneous pieces of paper. This was the most recent stack on my desk. Do you have a stack of paper like this on your workspace? Have you filled up your filling cabinets and are worried where the next batch of papers will go? Are you losing out on tax deductions because you can’t find your receipts? I’m not suggesting that you just shred everything and pray that the IRS does not come knocking on your door. It’s time to go electronic. The IRS does not require that you keep the original receipt. The only requirement is having a facsimile of the receipt. A facsimile could be a photocopy, photograph, scan or email confirmation. This allows you to make electronic copies of all of your receipts and get rid of all that paper that is cluttering up your workspace. This might take a little time and possibly a little money to get started, but you can get started for free as long as you have access to a camera. Here are the steps to convert to a paperless work space. Sign up for electronic statements. I no longer receive any of my bills or statements in paper format. I get an email when the statement is ready. I can go online and download the statement but most of the companies I do business with save all my statements online for me. This cuts down on about 70% of the paper that previously came into my house. Create some digital folders. I have a folder on my computer called 2014. In that folder, I have folders for more specific items I need to track like home repairs, business expenses, and charitable contributions. Don’t go crazy with the folders. You’ll get frustrated with the system and stop using it. A miscellaneous folder is a good thing to have. Opt in for electronic receipts. Some stores, like Staples and Home Depot, have started offering electronic receipts. I love this option. By the time I get home, the receipt is already in my inbox. I print the receipt to a PDF or download the attached PDF and file it in the appropriate digital folder. This saves me the step of having to scan the receipt when I get home. Create digital copies of any remaining pieces of paper. Depending on how much scanning you do each month, you may want to get a scanner. I have a Fujitsu ScanSnap. This is a pretty beefy scanner but I use it to scan multipage client documents. 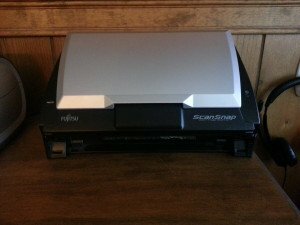 If you just need to scan a few pages at a time, this scanner might work well for you.Both scanners use wifi and can save documents directly to Evernote, Dropbox and Google Drive. If you don’t have a scanner, take a picture of your receipts. This might be a pain for multipage documents, but for normal receipts this works well. Just make sure to check the picture to ensure the text is legible. Have a backup plan.This does not mean keeping the paper! This is the biggest concern for clients who want to convert to a paperless system. What happens if my computer crashes? My response is always “what happens if you have a fire or break in?” No matter what happens, I have an offsite backup of all my files. Make sure that all of your electronic files are backed up. You can use Evernote, Dropbox or Google Drive for free. You can also get an automatic backup service for your computer. I first implemented this plan seven years ago when I started my business. This system saves me time, money, aggravation and space in my work space. I can easily file all of my receipts from my desk. I don’t have to purchase more file folders, file boxes and file cabinets. Whenever I need to find a receipt, I can easily find it in my electronic files. It makes my life so much easier. Unfortunately, this system will not help free up space when very large cats decide to invade your work space. Kristin Ingram is the owner of Kristin L. Ingram, CPA, a tax and consulting firm in Connecticut and a college instructor, teaching various accounting classes at a local university. You can find out more about her frugal adventures at www.PaymentFreeLife.com. I had not heard of Genius Scan. I will definitely check it out. Technology has come a long way to help make this process so much easier. Kristen, I was told if you cancel the account associated with the electric statement, you no longer have access to those records. Do you know for sure? I like your idea of putting a digital copy in a folder by year. If you cancel the account, you will lose access to the statement. When I cancel an account, I make sure to download the statements before I cancel. Make sure there is a reason you need the statements. A few years ago when we switched banks, I downloaded the statements for my business and our checking account, but I did not download the statements for the savings account because there was no activity that affected my taxes that could not be verified by another source (interest income on a 1099). I’m slowly working my way into a paperless age. I just like having paper because I tend to look at it as opposed to getting electronic statements. I see the email telling me my statement is ready then forget about it until the last minute. Something I need to work on! I also have an organizational system for my email, very similar to Michael Hyatt’s. When a bill comes in via email (which is rare because most are on autopay), I update my budget. When I pay bills every two weeks, the bill is already sitting in the budget to remind me to pay it. It’s all about finding a system that works for you. Maybe add the date you want to pay it as a reminder in your calendar. I already signed up for electronic statements started last 2012 and I’m happy with it. I even got a discount every year for signing up a paperless bill. I love when you get discounts for paperless billing. Less paper and saving money! Win-win! If possible, I always opt for electronic statements. I hate having papers cluttered all over the place, and it’s just easier to find stuff online/electronically. I haven’t found any stores that offer electronic receipts at my place, but I think it’s a good move for stores to start doing it to encourage customers to use less papers. Previous post: 3 ways to turn your commute to a profit center. #3 Can make you a LOT of money!